Our Cloud PBX systems utilize the latest technology in business voice services, providing a worry-free system that improves productivity and makes managing your communications operation as smooth as possible. 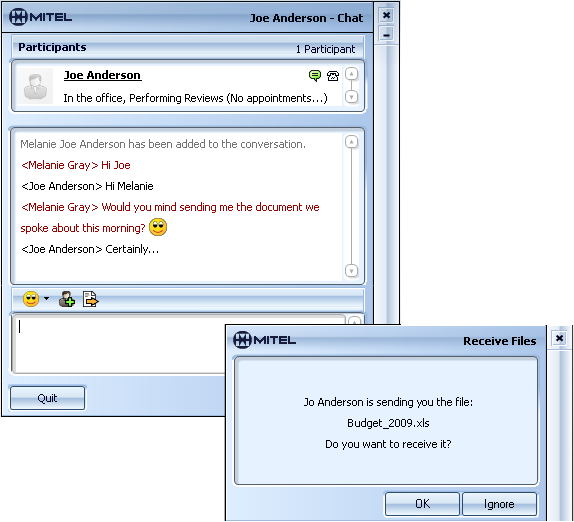 Unified Communicator® (UC) Advanced is Mitel’s award-winning unified communications client that integrates presence and availability, secure instant messaging, audio conferencing as well as web and video collaboration with the call control capabilities of your business communications system. 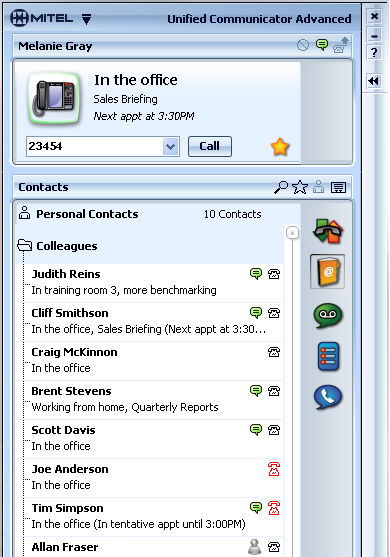 UC Advanced also integrates with leading business productivity tools like Microsoft Exchange®/Outlook and Office as well as IBM® Lotus Notes®. Unified Communicator® (UC) Mobile (Mobile Extension) empowers users by connecting a single phone number and a single voice mailbox to multiple devices, while providing them with access to the business communications features they need – anywhere, anytime. With UC Mobile, you can link (or twin) your extension with your mobile device, your home phone or just about any other telephone number. An incoming call will simultaneously ring both your extension and the twinned device. The device that you use to answer the call establishes a voice path and the other device will cease to ring. UC Mobile extends a range of common virtual PBX features to the selected twinned device and provides a truly integrated mobile and desktop experience by enabling seamlessly switching communications from one device to another. Convergence Reporting Package is a comprehensive call reporting solution that is available as either a single site or multi-site solution, and can optionally be integrated with the Convergence Contact Center Management Software. Robust and reliable, it enables you to monitor and control telecommunication costs and give you a true picture of how much money is being spent and who is spending it. For companies looking to cost-effectively optimize productivity, telecommuting solutions allow employees “plug and work” access to the corporate voice and data network from home or on the road, seamlessly retaining all of the features and functionality enjoyed at the office. Choose how your calls are forwarded, including round-robin, simultaneous, least-time, and skills-based distributions. Keep your callers in a queue for a representative during your peak hours instead of losing them to voicemail. See Contact Center.